This quiet street once had a national reputation - for drunkenness and debauchery. 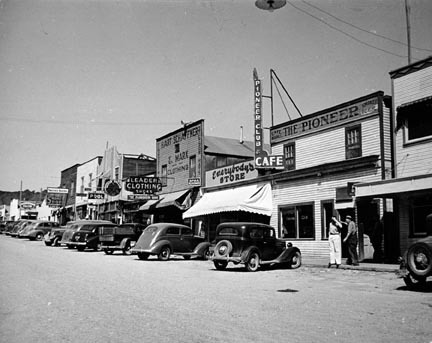 B Street was the busiest street in the Columbia River Basin during the construction of the Grand Coulee Dam in the 1930s. Construction workers came to spend their money on this mud street, which featured ramshackle structures, loud music, and fun-loving women. 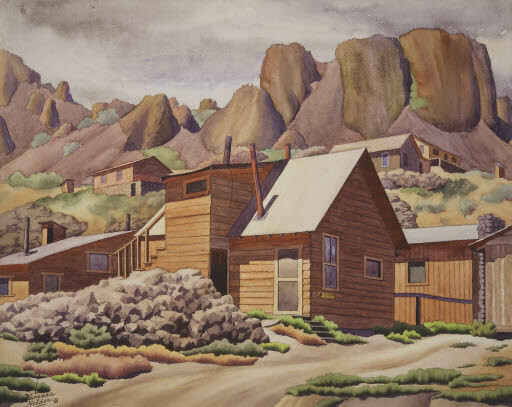 As construction began on the dam in 1933, opportunistic businessmen and women saw a profit to be earned from the influx of wage earners and provided the dam workers with entertainment and a place to spend their money. The buildings were raised quickly and at first there was no power or sewer connection. Businesses ran off of well water and kerosene lamps increasing the danger of fires, two of which almost destroyed the entire street. Sewage was channeled to nearby Rattlesnake Canyon giving the street a distinct odor. Two story buildings on both sides of the dusty or muddy lane contained bars, dance halls, and restaurants. Beer was sold at ten cents a glass. The second floors held sleeping rooms and prostitutes available for two dollars per twenty minutes. Venereal disease was so common that the town of Grand Coulee required weekly checkups and was described as "the cesspool of the New Deal." Women also found jobs on The Street as taxi dancers in the dance halls. Purchasing tickets for five cents from the dance hall, they would charge ten cents per dance. The orchestras would sometimes play at a tempo so fast a couple could hardly make it around the floor for each dance. The Street was connected to the sewer and electricity in 1934. This encouraged more business, increasing the street's repertoire to grocery stores, hardware stores, dry cleaners, movie theaters, and a bowling alley, mildly taming it's risqué image. 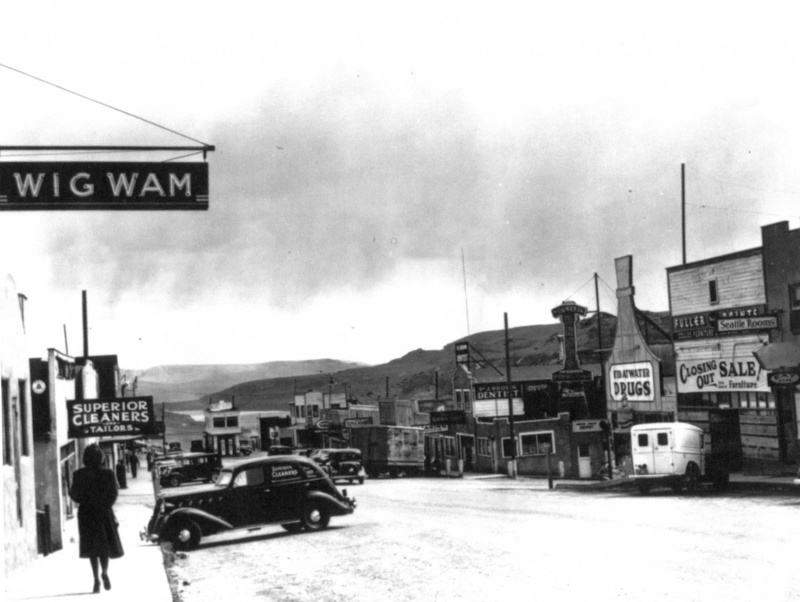 Though the towns of Masson City, Electric City, and Grand Coulee thought of The Street as "the shanties" it was also described by former patrons of the area as, "the life of the party, where all of the action was." Residents of the surrounding towns, even married couples, would venture to the street where everything was "open because here you'd have these guys with their wives sitting out in cars watching all the action for entertainment" and collecting gossip about who they saw out on The Street. As construction on the dam came to an end, and workers moved on to their next prospects, business slowed on B Street, and one by one the opportunistic entrepreneurs packed up and left. Now the buildings along this once rowdy strip house bait shops and convenience stores. B Street: B Street at the height of its glory, probably the lat 1930s. Photograph courtesy of Lake Roosevelt National Recreation Area. 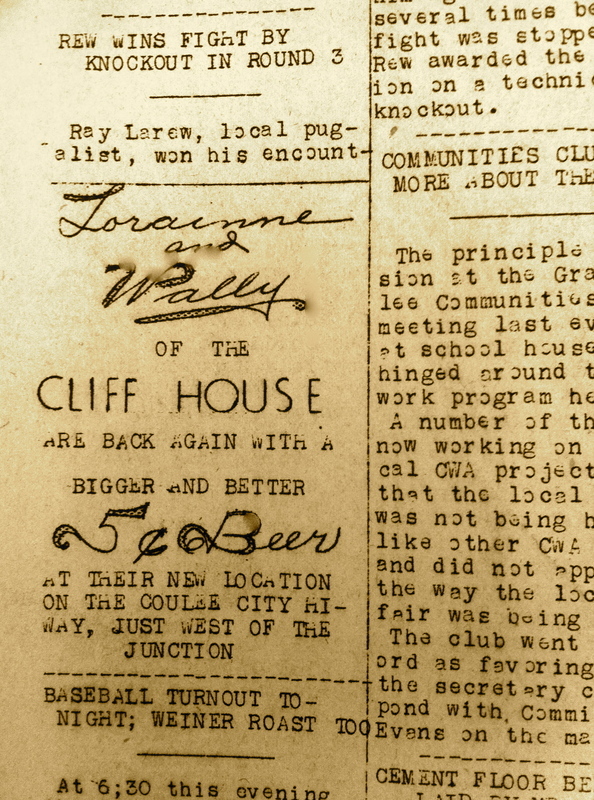 Lorainne and Wally of the Cliff House: Most establishments on "the Street" sold beer for 10 cents a glass. This advertisement, found in the local Grand Coulee daily newspaper, boasts beer sold at 5 cents a glass and a new location. Courtesy of The Northwest Room at the Spokane Public Library. 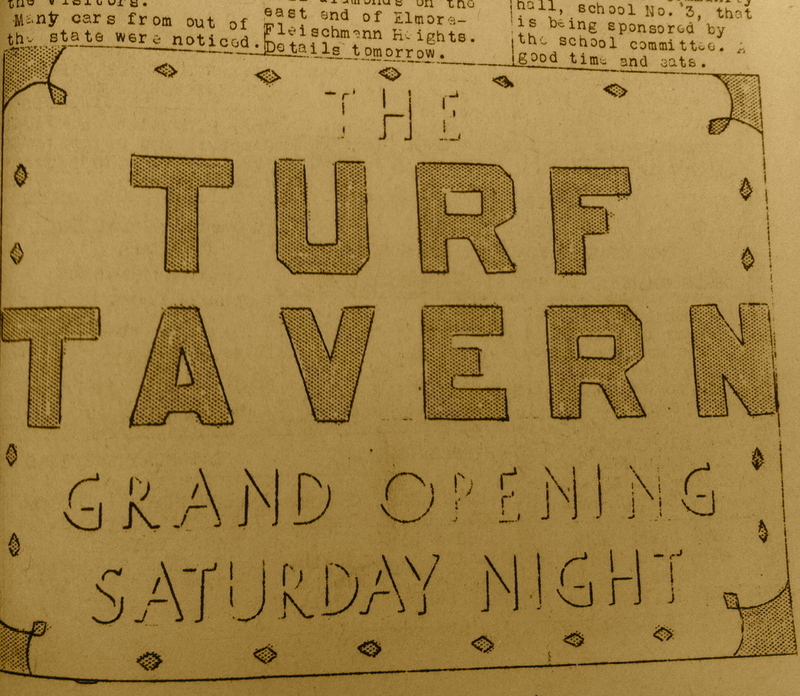 The Turf Tavern: Advertisements, such as this one, filled The Grand Coulee Daily Booster, encouraging workers to find relaxation after hours on "The Street." Courtesy of The Northwest Room at the Spokane Public Library. 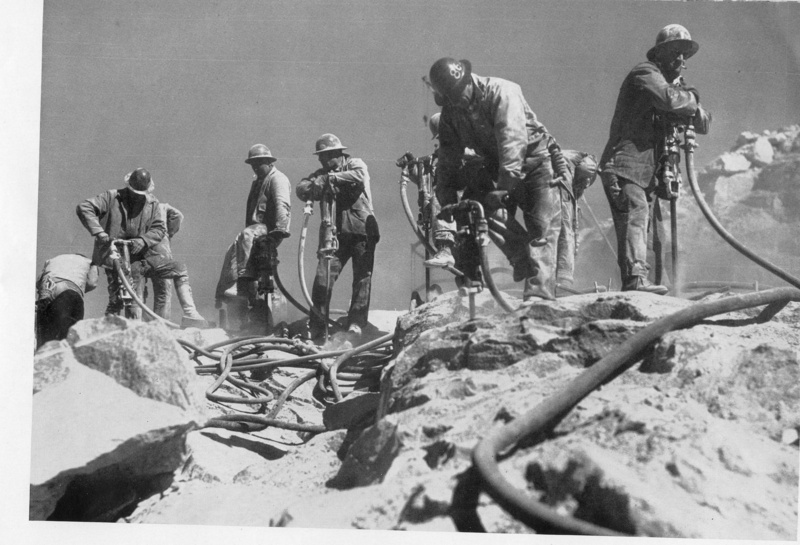 Jackhammer Workers. : Labors had a variety of jobs on the dam, but they could all find something in common on B Street. Courtesy of the Bureau of Reclamation. Courtesy of Internet Archive at archive.org. 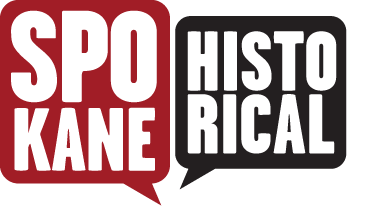 Erin Pulley, “B Street,” Spokane Historical, accessed April 24, 2019, https://spokanehistorical.org/items/show/375.